Du hast den Facelift nicht korrekt installiert. 40 16:53:30 - - Warning: Did not find texture file "30er_reihensiedlung01.bmp"! 41 16:53:30 - - Warning: Did not find texture file "SD_Rad_v.bmp"! 42 16:53:30 - - Warning: Did not find texture file "reifen.bmp"! 67 16:53:32 - - Warning: Did not find texture file "path_car_1.bmp"! 70 16:53:58 - - Warning: Did not find texture file "texture.tga"! 71 16:53:58 - - Warning: Did not find texture file "Snow_1.bmp.001"! 92 16:54:11 - - Warning: Cloudtype "-1" could not be found! 95 16:54:11 - - Information: maps\Grundorf\global.cfg map loaded! 100 16:54:14 - - Warning: Did not find texture file "Textfeld_1.bmp"! 101 16:54:15 - - Warning: Did not find texture file "Hst_Reiter_2dgt.bmp"! 102 16:54:15 - - Warning: Did not find texture file "StrSchild_Text1.bmp"! 103 16:54:15 - - Warning: Did not find texture file "StrSchild_Text1.bmp"! 104 16:54:15 - - Warning: Did not find texture file "StrSchild_Text2.bmp"! 105 16:54:17 - - Warning: Did not find texture file "StrSchild_Text2.bmp"! 106 16:54:17 - - Warning: Did not find texture file "StrSchild_Text1.bmp"! 107 16:54:17 - - Warning: Did not find texture file "text.bmp"! 108 16:54:17 - - Warning: Did not find texture file "text.bmp"! 119 16:54:36 - - Warning: Did not find texture file "textfeld_thermo.tga"! 120 16:54:37 - - Warning: Did not find texture file "Drucker-Textfeld.tga"! 121 16:54:37 - - Warning: Did not find texture file "IBIS2-Textfeld.tga"! 122 16:54:37 - - Warning: Did not find texture file "IBIS2-Delay_min.tga"! 123 16:54:37 - - Warning: Did not find texture file "IBIS2-Delay_sec.tga"! 124 16:54:37 - - Warning: Did not find texture file "IBIS2-Delay_state.tga"! 125 16:54:38 - - Warning: Did not find texture file "temp.bmp"! 126 16:54:38 - - Warning: Did not find texture file "D_wagennummer.tga"! 127 16:54:39 - - Warning: Did not find texture file "temp.bmp"! 128 16:54:39 - - Warning: Did not find texture file "LCD-Innenanzeige.bmp"! 129 16:54:40 - - Warning: Did not find texture file "D_kennzeichen.tga"! 130 16:54:40 - - Warning: Did not find texture file "D_wagennummer.tga"! 131 16:54:41 - - Warning: File Vehicles\MAN_NL_NG\model\model_GN92_main.cfg: texture filename dreck.tga not found in mesh file Vehicles\MAN_NL_NG\model\GN92\GN92_main_wagenkasten_dreck.o3d! 132 16:54:42 - - Warning: File Vehicles\MAN_NL_NG\model\model_GN92_main.cfg: texture filename dreck.tga not found in mesh file Vehicles\MAN_NL_NG\model\GN92\GN92_articul_bellows_dirt.o3d! 133 16:54:42 - - Warning: File Vehicles\MAN_NL_NG\model\model_GN92_main.cfg: texture filename regen.tga not found in mesh file Vehicles\MAN_NL_NG\model\GN92\LOD_GN92_main_tuer_MV.o3d! 134 16:54:42 - - Warning: File Vehicles\MAN_NL_NG\model\model_GN92_main.cfg: texture filename regen.tga not found in mesh file Vehicles\MAN_NL_NG\model\GN92\LOD_GN92_main_tuer_MH.o3d! 135 16:54:42 - - Warning: Did not find texture file "D_Rad_v.bmp"! 136 16:54:50 - - Warning: Did not find texture file "LCD-Innenanzeige.bmp"! 137 16:54:51 - - Warning: Did not find texture file "D_wagennummer.tga"! 138 16:54:51 - - Warning: Did not find texture file "D_kennzeichen.tga"! 139 16:54:52 - - Warning: File Vehicles\MAN_NL_NG\model\model_GN92_trail.cfg: texture filename dreck.tga not found in mesh file Vehicles\MAN_NL_NG\model\GN92\GN92_trail_wagenkasten_dreck.o3d! 145 16:55:00 - - Warning: Direct3D-Device lost! 146 16:55:00 - - Information: Direct3D-Device resetted! 152 16:55:05 - - Warning: Did not find texture file "Kennz.bmp"! 153 16:55:06 - - Warning: Did not find texture file "Kennz.bmp"! 154 16:55:07 - - Warning: Did not find texture file "Kennz.bmp"! 155 16:55:07 - - Warning: Did not find texture file "Kennz.bmp"! 161 16:55:12 - - Warning: Did not find texture file "textfeld_thermo.tga"! 162 16:55:37 - - Warning: Did not find texture file "textfeld_thermo-aus.tga"! 163 16:55:37 - - Warning: Did not find texture file "textfeld_thermo.tga"! 164 16:55:37 - - Warning: Did not find texture file "textfeld_clock.tga"! 165 16:55:39 - - Warning: Did not find texture file "Linienliste_ANX.bmp"! 166 16:55:39 - - Warning: Did not find texture file "Linienliste_ANX.bmp"! 167 16:55:40 - - Warning: Did not find texture file "Drucker-Textfeld.tga"! 168 16:55:40 - - Warning: Did not find texture file "IBIS2-Textfeld.tga"! 169 16:55:40 - - Warning: Did not find texture file "IBIS2-Delay_min.tga"! 170 16:55:40 - - Warning: Did not find texture file "IBIS2-Delay_sec.tga"! 171 16:55:40 - - Warning: Did not find texture file "IBIS2-Delay_state.tga"! 172 16:55:40 - - Warning: Did not find texture file "D_kennzeichen.bmp"! 173 16:55:40 - - Warning: Did not find texture file "D_wagennummer.bmp"! 174 16:55:41 - - Warning: Did not find texture file "LCD-Innenanzeige.bmp"! 175 16:55:41 - - Warning: Did not find texture file "textfeld_thermo-aus.tga"! 176 16:55:41 - - Warning: Did not find texture file "textfeld_thermo.tga"! 177 16:56:05 - - Warning: File vehicles\MB_O530_Facelift_UE\model\model_O530GUE_FL_EF_3doors_Main.cfg: texture filename UE_EF_main_01white.tga not found in mesh file vehicles\MB_O530_Facelift_UE\model\18m_main_UE_EF\wagenkasten_AST_vorne.o3d! 178 16:56:05 - - Warning: File vehicles\MB_O530_Facelift_UE\model\model_O530GUE_FL_EF_3doors_Main.cfg: texture filename UE_EF_main_01white.tga not found in mesh file vehicles\MB_O530_Facelift_UE\model\18m_main_UE_EF\wagenkasten_AST_hinten.o3d! 179 16:56:06 - - Warning: File vehicles\MB_O530_Facelift_UE\model\model_O530GUE_FL_EF_3doors_Main.cfg: texture filename UE_EF_main_01white.tga not found in mesh file vehicles\MB_O530_Facelift_UE\model\18m_main_UE_EF\Aussenschwenk\Tuer_V.o3d! 180 16:56:06 - - Warning: File vehicles\MB_O530_Facelift_UE\model\model_O530GUE_FL_EF_3doors_Main.cfg: texture filename UE_EF_main_01white.tga not found in mesh file vehicles\MB_O530_Facelift_UE\model\18m_main_UE_EF\Aussenschwenk\Tuer_HV.o3d! 181 16:56:06 - - Warning: File vehicles\MB_O530_Facelift_UE\model\model_O530GUE_FL_EF_3doors_Main.cfg: texture filename UE_EF_main_01white.tga not found in mesh file vehicles\MB_O530_Facelift_UE\model\18m_main_UE_EF\Aussenschwenk\Tuer_HH.o3d! 182 16:56:06 - - Warning: File vehicles\MB_O530_Facelift_UE\model\model_O530GUE_FL_EF_3doors_Main.cfg: texture filename UE_EF_main_01white.tga not found in mesh file vehicles\MB_O530_Facelift_UE\model\18m_main_UE_EF\Schwenkschiebe\Tuer_V.o3d! 183 16:56:06 - - Warning: File vehicles\MB_O530_Facelift_UE\model\model_O530GUE_FL_EF_3doors_Main.cfg: texture filename UE_EF_main_01white.tga not found in mesh file vehicles\MB_O530_Facelift_UE\model\18m_main_UE_EF\Schwenkschiebe\Tuer_HV.o3d! 184 16:56:06 - - Warning: File vehicles\MB_O530_Facelift_UE\model\model_O530GUE_FL_EF_3doors_Main.cfg: texture filename UE_EF_main_01white.tga not found in mesh file vehicles\MB_O530_Facelift_UE\model\18m_main_UE_EF\Schwenkschiebe\Tuer_HH.o3d! 185 16:56:13 - - Warning: File vehicles\MB_O530_Facelift_UE\model\model_O530GUE_FL_EF_3doors_Main.cfg: texture filename vdo_0.dds not found in mesh file vehicles\MB_O530_Facelift_UE\model\12m_UE\panel.o3d! 186 16:56:13 - - Warning: File vehicles\MB_O530_Facelift_UE\model\model_O530GUE_FL_EF_3doors_Main.cfg: texture filename anheben.jpg not found in mesh file vehicles\MB_O530_Facelift_UE\model\generic\taster_anheben.o3d! 188 16:56:13 - - Error: In "vehicles\MB_O530_Facelift_UE\model\model_O530GUE_FL_EF_3doors_Main.cfg" there was an error in line 5698! 189 16:56:15 - - Warning: File vehicles\MB_O530_Facelift_UE\model\model_O530GUE_FL_EF_3doors_Trail.cfg: texture filename UE_trailer_01white.tga not found in mesh file vehicles\MB_O530_Facelift_UE\model\18m_trail_UE\Aussenschwenk\Tuer_HV.o3d! 190 16:56:15 - - Warning: File vehicles\MB_O530_Facelift_UE\model\model_O530GUE_FL_EF_3doors_Trail.cfg: texture filename UE_trailer_01white.tga not found in mesh file vehicles\MB_O530_Facelift_UE\model\18m_trail_UE\Aussenschwenk\Tuer_HH.o3d! 191 16:56:15 - - Warning: File vehicles\MB_O530_Facelift_UE\model\model_O530GUE_FL_EF_3doors_Trail.cfg: texture filename UE_trailer_01white.tga not found in mesh file vehicles\MB_O530_Facelift_UE\model\18m_trail_UE\Schwenkschiebe\Tuer_HV.o3d! 192 16:56:15 - - Warning: File vehicles\MB_O530_Facelift_UE\model\model_O530GUE_FL_EF_3doors_Trail.cfg: texture filename UE_trailer_01white.tga not found in mesh file vehicles\MB_O530_Facelift_UE\model\18m_trail_UE\Schwenkschiebe\Tuer_HH.o3d! 193 16:56:19 - - Warning: File vehicles\MB_O530_Facelift_UE\model\model_O530GUE_FL_EF_3doors_Trail.cfg: texture filename fenster_tint.tga not found in mesh file vehicles\MB_O530_Facelift_UE\model\18m_trail_UE\Fenster_ext.o3d! 194 16:56:19 - - Warning: File vehicles\MB_O530_Facelift_UE\model\model_O530GUE_FL_EF_3doors_Trail.cfg: texture filename Fenster.tga not found in mesh file vehicles\MB_O530_Facelift_UE\model\18m_trail_UE\Aussenschwenk\Tuerfenst_HV.o3d! 195 16:56:19 - - Warning: File vehicles\MB_O530_Facelift_UE\model\model_O530GUE_FL_EF_3doors_Trail.cfg: texture filename Fenster.tga not found in mesh file vehicles\MB_O530_Facelift_UE\model\18m_trail_UE\Aussenschwenk\Tuerfenst_HH.o3d! 196 16:56:19 - - Warning: File vehicles\MB_O530_Facelift_UE\model\model_O530GUE_FL_EF_3doors_Trail.cfg: texture filename d_dreck.tga not found in mesh file vehicles\MB_O530_Facelift_UE\model\18m_trail_UE\Innenschwenk\Tuerfenst_V.o3d! 197 16:56:19 - - Warning: File vehicles\MB_O530_Facelift_UE\model\model_O530GUE_FL_EF_3doors_Trail.cfg: texture filename d_dreck.tga not found in mesh file vehicles\MB_O530_Facelift_UE\model\18m_trail_UE\Innenschwenk\Tuerfenst_H.o3d! 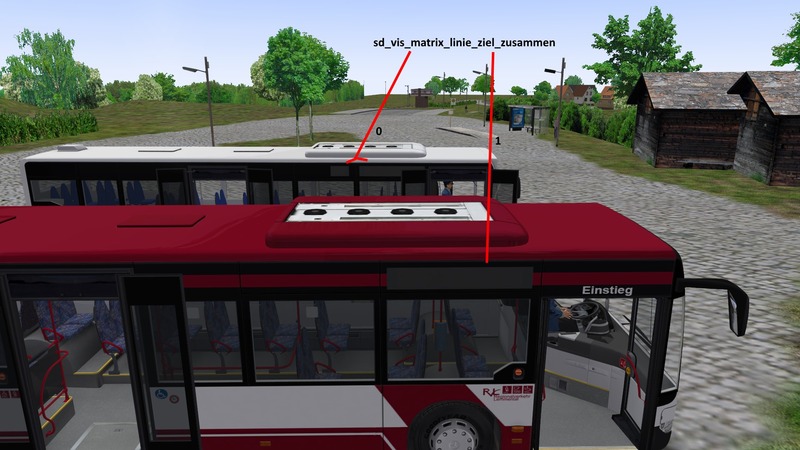 201 16:56:48 - - Error: Fehler: im Befehl "(L.L.door_wheelchair)" (vehicles\MB_O530_Facelift_UE\\script\voith_DIWA.osc) ist der Variablenname ungültig! 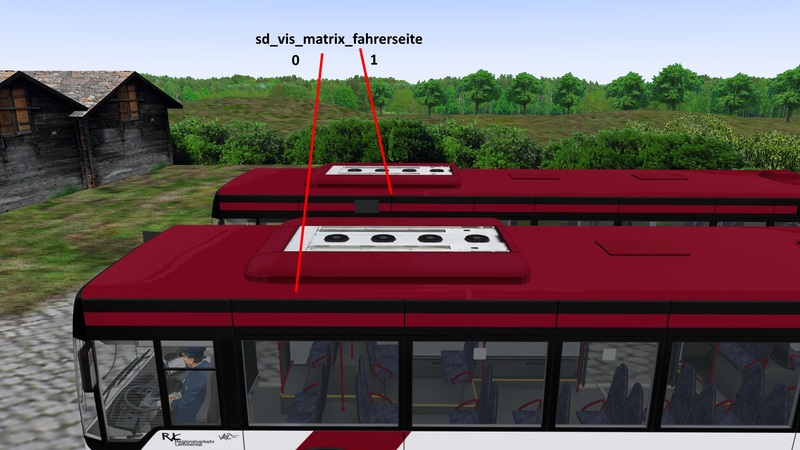 202 16:56:48 - - Error: Fehler: im Befehl "(L.L.door_wheelchair)" (vehicles\MB_O530_Facelift_UE\\script\voith_DIWA.osc) ist der Variablenname ungültig! 219 16:56:49 - - Error: Fehler: im Befehl "(M.L.novitus_frame)" (vehicles\MB_O530_Facelift_UE\\script\O530G_main.osc) ist der Macroname ungültig! 220 16:56:49 - - Error: Fehler: im Befehl "(M.L.novitus_money_frame)" (vehicles\MB_O530_Facelift_UE\\script\O530G_main.osc) ist der Macroname ungültig! 221 16:56:49 - - Error: Fehler: im Befehl "(M.L.Antrieb_Frame)" (vehicles\MB_O530_Facelift_UE\\script\O530G_main.osc) ist der Macroname ungültig! 222 16:56:49 - - Error: Fehler: im Befehl "(M.L.novitus_init)" (vehicles\MB_O530_Facelift_UE\\script\O530G_main.osc) ist der Macroname ungültig! 223 16:56:49 - - Error: Fehler: im Befehl "(M.L.Antrieb_Init)" (vehicles\MB_O530_Facelift_UE\\script\O530G_main.osc) ist der Macroname ungültig! 224 16:56:50 - - Warning: File vehicles\MB_O530_Facelift_UE\model\model_O530GUE_FL_EF_3doors_Main.cfg: texture filename UE_EF_main_01white.tga not found in mesh file vehicles\MB_O530_Facelift_UE\model\18m_main_UE_EF\wagenkasten_AST_vorne.o3d! 225 16:56:50 - - Warning: File vehicles\MB_O530_Facelift_UE\model\model_O530GUE_FL_EF_3doors_Main.cfg: texture filename UE_EF_main_01white.tga not found in mesh file vehicles\MB_O530_Facelift_UE\model\18m_main_UE_EF\wagenkasten_AST_hinten.o3d! 226 16:56:51 - - Warning: File vehicles\MB_O530_Facelift_UE\model\model_O530GUE_FL_EF_3doors_Main.cfg: texture filename UE_EF_main_01white.tga not found in mesh file vehicles\MB_O530_Facelift_UE\model\18m_main_UE_EF\Aussenschwenk\Tuer_V.o3d! 227 16:56:51 - - Warning: File vehicles\MB_O530_Facelift_UE\model\model_O530GUE_FL_EF_3doors_Main.cfg: texture filename UE_EF_main_01white.tga not found in mesh file vehicles\MB_O530_Facelift_UE\model\18m_main_UE_EF\Aussenschwenk\Tuer_HV.o3d! 228 16:56:51 - - Warning: File vehicles\MB_O530_Facelift_UE\model\model_O530GUE_FL_EF_3doors_Main.cfg: texture filename UE_EF_main_01white.tga not found in mesh file vehicles\MB_O530_Facelift_UE\model\18m_main_UE_EF\Aussenschwenk\Tuer_HH.o3d! 229 16:56:51 - - Warning: File vehicles\MB_O530_Facelift_UE\model\model_O530GUE_FL_EF_3doors_Main.cfg: texture filename UE_EF_main_01white.tga not found in mesh file vehicles\MB_O530_Facelift_UE\model\18m_main_UE_EF\Schwenkschiebe\Tuer_V.o3d! 230 16:56:51 - - Warning: File vehicles\MB_O530_Facelift_UE\model\model_O530GUE_FL_EF_3doors_Main.cfg: texture filename UE_EF_main_01white.tga not found in mesh file vehicles\MB_O530_Facelift_UE\model\18m_main_UE_EF\Schwenkschiebe\Tuer_HV.o3d! 231 16:56:51 - - Warning: File vehicles\MB_O530_Facelift_UE\model\model_O530GUE_FL_EF_3doors_Main.cfg: texture filename UE_EF_main_01white.tga not found in mesh file vehicles\MB_O530_Facelift_UE\model\18m_main_UE_EF\Schwenkschiebe\Tuer_HH.o3d! 232 16:56:58 - - Warning: File vehicles\MB_O530_Facelift_UE\model\model_O530GUE_FL_EF_3doors_Main.cfg: texture filename vdo_0.dds not found in mesh file vehicles\MB_O530_Facelift_UE\model\12m_UE\panel.o3d! 233 16:56:59 - - Warning: File vehicles\MB_O530_Facelift_UE\model\model_O530GUE_FL_EF_3doors_Main.cfg: texture filename anheben.jpg not found in mesh file vehicles\MB_O530_Facelift_UE\model\generic\taster_anheben.o3d! 235 16:56:59 - - Error: In "vehicles\MB_O530_Facelift_UE\model\model_O530GUE_FL_EF_3doors_Main.cfg" there was an error in line 5698! 236 16:57:00 - - Warning: File vehicles\MB_O530_Facelift_UE\model\model_O530GUE_FL_EF_3doors_Trail.cfg: texture filename UE_trailer_01white.tga not found in mesh file vehicles\MB_O530_Facelift_UE\model\18m_trail_UE\Aussenschwenk\Tuer_HV.o3d! 237 16:57:01 - - Warning: File vehicles\MB_O530_Facelift_UE\model\model_O530GUE_FL_EF_3doors_Trail.cfg: texture filename UE_trailer_01white.tga not found in mesh file vehicles\MB_O530_Facelift_UE\model\18m_trail_UE\Aussenschwenk\Tuer_HH.o3d! 238 16:57:01 - - Warning: File vehicles\MB_O530_Facelift_UE\model\model_O530GUE_FL_EF_3doors_Trail.cfg: texture filename UE_trailer_01white.tga not found in mesh file vehicles\MB_O530_Facelift_UE\model\18m_trail_UE\Schwenkschiebe\Tuer_HV.o3d! 239 16:57:01 - - Warning: File vehicles\MB_O530_Facelift_UE\model\model_O530GUE_FL_EF_3doors_Trail.cfg: texture filename UE_trailer_01white.tga not found in mesh file vehicles\MB_O530_Facelift_UE\model\18m_trail_UE\Schwenkschiebe\Tuer_HH.o3d! 240 16:57:05 - - Warning: File vehicles\MB_O530_Facelift_UE\model\model_O530GUE_FL_EF_3doors_Trail.cfg: texture filename fenster_tint.tga not found in mesh file vehicles\MB_O530_Facelift_UE\model\18m_trail_UE\Fenster_ext.o3d! 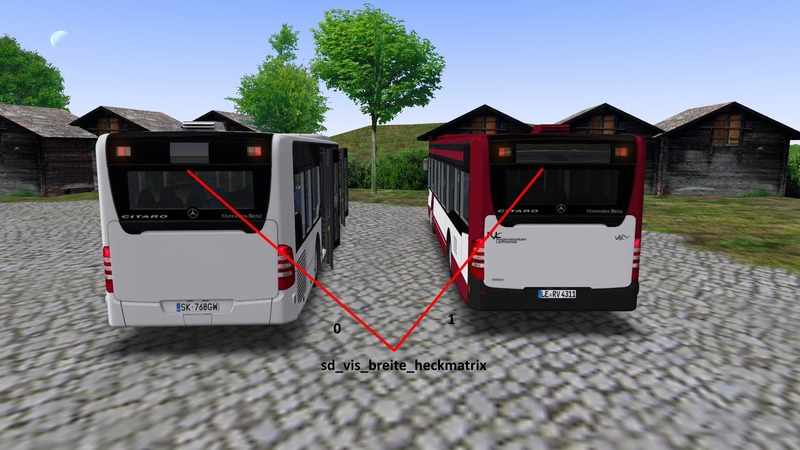 241 16:57:05 - - Warning: File vehicles\MB_O530_Facelift_UE\model\model_O530GUE_FL_EF_3doors_Trail.cfg: texture filename Fenster.tga not found in mesh file vehicles\MB_O530_Facelift_UE\model\18m_trail_UE\Aussenschwenk\Tuerfenst_HV.o3d! 242 16:57:05 - - Warning: File vehicles\MB_O530_Facelift_UE\model\model_O530GUE_FL_EF_3doors_Trail.cfg: texture filename Fenster.tga not found in mesh file vehicles\MB_O530_Facelift_UE\model\18m_trail_UE\Aussenschwenk\Tuerfenst_HH.o3d! 243 16:57:05 - - Warning: File vehicles\MB_O530_Facelift_UE\model\model_O530GUE_FL_EF_3doors_Trail.cfg: texture filename d_dreck.tga not found in mesh file vehicles\MB_O530_Facelift_UE\model\18m_trail_UE\Innenschwenk\Tuerfenst_V.o3d! 244 16:57:05 - - Warning: File vehicles\MB_O530_Facelift_UE\model\model_O530GUE_FL_EF_3doors_Trail.cfg: texture filename d_dreck.tga not found in mesh file vehicles\MB_O530_Facelift_UE\model\18m_trail_UE\Innenschwenk\Tuerfenst_H.o3d! 250 16:57:06 - - Warning: Soundfile vehicles\MB_O530_Facelift_UE\sound-citaro\pedal-gas.wav does not exist! 251 16:57:06 - - Warning: Soundfile vehicles\MB_O530_Facelift_UE\sound-citaro\pedal-bremse.wav does not exist! 252 16:57:06 - - Warning: Soundfile vehicles\MB_O530_Facelift_UE\sound-citaro\pedal-kickdown.wav does not exist! 253 16:57:06 - - Warning: Soundfile vehicles\MB_O530_Facelift_UE\sound-citaro\Gelenk1.wav does not exist! 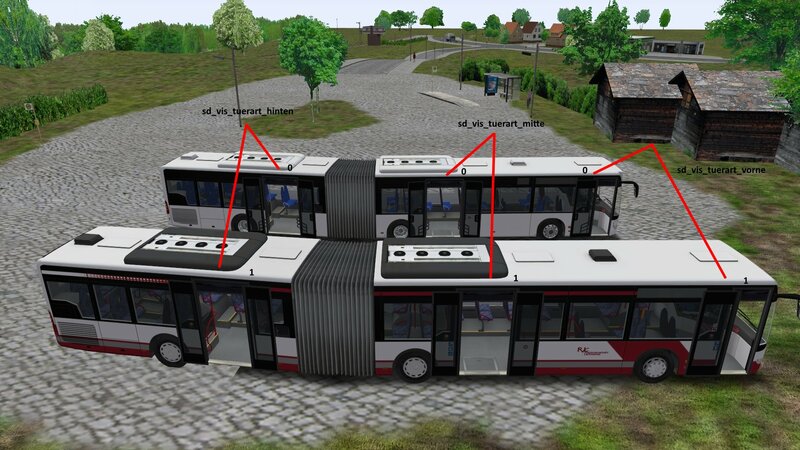 254 16:57:06 - - Warning: Soundfile vehicles\MB_O530_Facelift_UE\sound-citaro\Gelenk2.wav does not exist! 255 16:57:06 - - Warning: Soundfile vehicles\MB_O530_Facelift_UE\sound-citaro\chat-low.wav does not exist! 256 16:57:06 - - Warning: Soundfile vehicles\MB_O530_Facelift_UE\sound-citaro\chat-high.wav does not exist! 486 16:57:21 - - Information: Actual map closed! Hast du die Readme befolgt? Ich habe ein problem mit dem Facelift Ü/GÜ, genau zu sagen mit der Haltestellenanzeige. Bei den normalen Citaro FL, schildert er mir: "Fellhornstraße" so wie es eigl. soll. Bei den Facelift Ü/GÜ Bussen schildert er mir: "Fellhornstr." was er nicht soll, und wenn die tür auf ist dann zeigt er mir noch Oberstdorf.tga an, was bei den Standard FL nicht der fall ist. Aber bei den hLA Citaros FL da geht es, also muss es irgdwie mit den Drucker zu tun haben/IBIS. Edited once, last by BKF92XD ( Dec 9th 2018 ). gibt es eine Möglichkeit diese tolle Kasse auch in die normalen Facelift Busse einzubauen? Ich würde mich sehr über eine Anleitung freuen, vielen Dank. 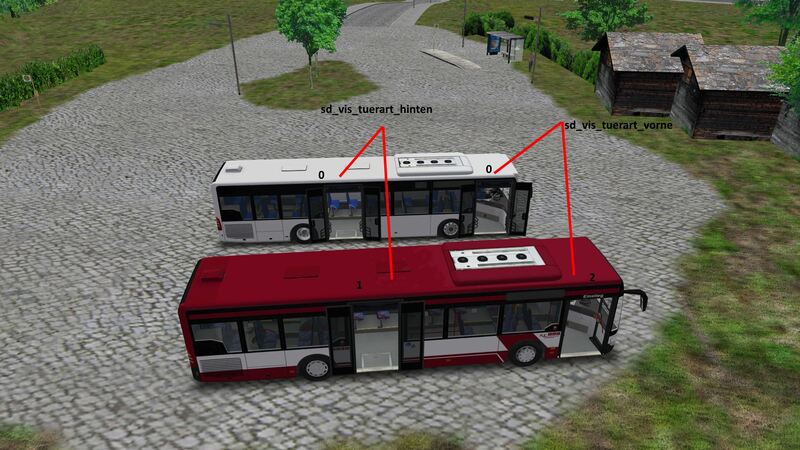 Citaro II LE, ein toller Bus. Kann es sein, dass der Nachläufer beim G keine Schmutztextur hat? Is there a list of every setvar with pictures? Dadurch, dass ich an dem Wagen viel gemacht habe und die Möglichkeit auch bestand, eigene Setvars einzuarbeiten, habe ich dies natürlich gemacht. 2 = Innenschwenktüren (nur Doppeflügelige Wagen!! Es sind hier nicht alle Beispiele an Türvariationen gezeigt worden, somit sind andere Variationen ebenfalls möglich. INFO: Wenn ihr die Setvars verwendet, die die Türen ändern, muss dieses auch auf dem Template bzw. Repaint geschehen! Dafür liegen für jeden Wagen .pdn Dateien für paint.net bei, womit ihr dieses einfach allein machen könnt. where can i find the old one? Ich wollte mal fragen, ob vllt. irgendwann mal Klappfenster in dem Ü geplant sind, oder vorne die Einstiegsstange? Ich denke, so eine Version wird nicht (mehr) kommen. Edited once, last by Busfahrer_Lord ( Mar 3rd 2019 ). -Ansagen sollten gehen, wenn du einen Fahrplan ausgewählt hast, und dann Linie und Route im Fahrscheindrucker eingibst. da in den Unterordnern sind .cti Dateien, da müssen die "[setvar]" Einstellungen rein. statt MB_O530_Facelift_UE kann der Ordner auch anders heißen.